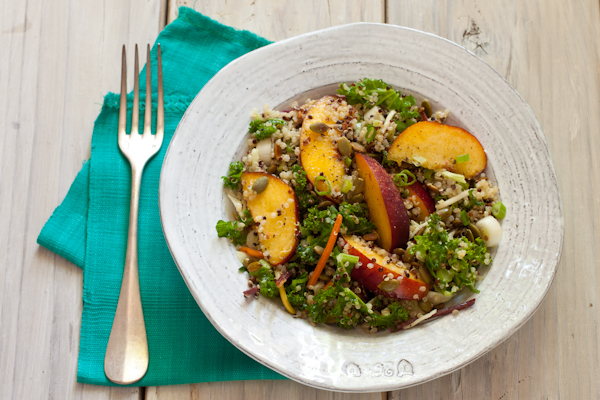 Enjoy this quinoa nectarine slaw from Susan Pridmore’s new cookbook: The Simply Vegetarian Cookbook: Fuss-Free Recipes Everyone Will Love . I’ve known Susan, who writes The Wimpy Vegetarian blog, for years through our online food blogger community. It’s always exciting to see a pal get published, and I’m happy to share this delightful recipe along with my review of her new cookbook. Susan is a culinary school grad who decided to go vegetarian while her carnivore husband did not. The book and her blog focus on how you can eat more plants whatever your dietary preferences. This simple salad is a light and refreshing meal on a hot summer day. The nectarines should be at, or close to, their peak ripeness so that their natural sweetness can perfectly combine with the earthy pumpkin seeds. If you don’t see ripe nectarines at your market, you can use peaches, since nectarines are just peaches without the fuzz. The book is organized into eight chapters: Meatless Made Easy, No Cook, Thirty Minutes Max, Five Ingredients, One Pot & Skillet, Sheet Pan & Baking Dish, Slow Cooker & Pressure Cooker, and Kitchen Staples. I think readers will like this arrangement, as you can clearly find meals based on the time and tools you have. 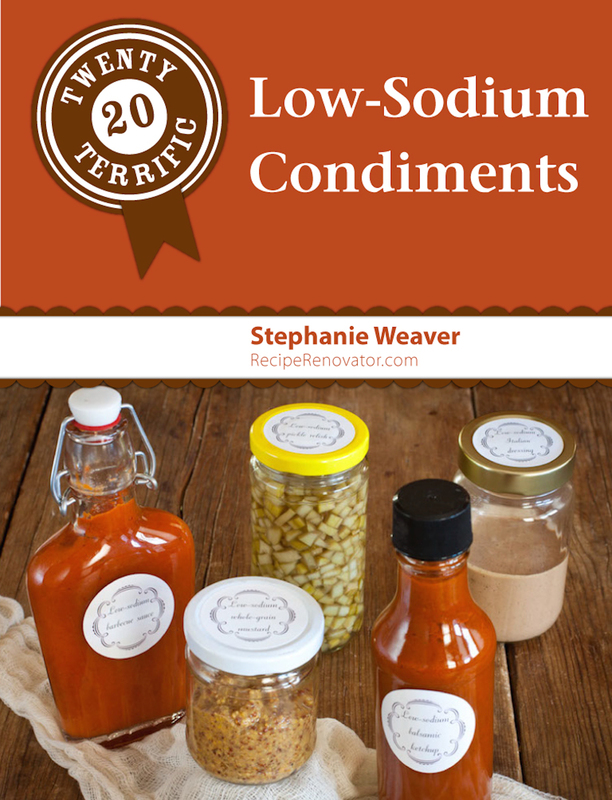 The fonts are easy to read and recipes are laid out in a user-friendly manner. Each chapter opens with a full-color photograph, offering insight to the delicious finished recipes. Recipes include Mediterranean wrap with spicy roasted chickpeas, loaded sweet potato nacho fries, caramelized mushrooms over polenta, crispy black bean burgers, Spanish paella, Swiss chard and orzo gratin, chickpea and coconut-curry soup, and balsamic roasted tomatoes. I really liked this quinoa and nectarine slaw with the lemon vinaigrette. My only note is that I diced the nectarines so it was easier to eat, and I bought a bag of pre-mixed raw slaw. Clear layout, friendly tone, and a slew of new recipes to try. Recipes are coded for special diets and nutritional analysis is provided, which is helpful for low-sodium and low-carb eaters. A note about my cookbook reviews: In the past, I tested at least three recipes from each book, took photos, and described my experience. Due to my dietary limitations (low-sodium, gluten-, dairy-, egg-free), it is no longer possible for me to test the recipes and do them justice. I did make this quinoa nectarine slaw without the optional feta cheese. For people following my Migraine Relief Plan, I suggest my Bacon Salad Dressing (page 266) or Italian dressing (page 269). Required FTC disclosure: I received one copy of this book from the publisher. 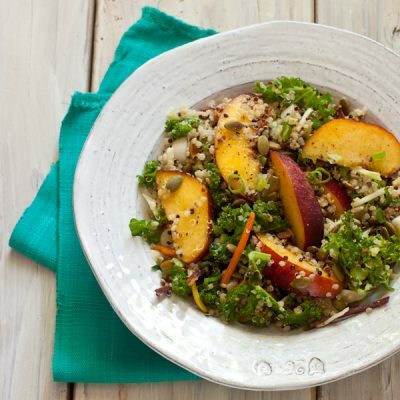 In a large bowl, combine the quinoa, nectarines, cabbage, kale, scallions, and pumpkin seeds. Make the vinaigrette: In a small bowl, whisk together the lemon juice, mustard, salt, and pepper. Gradually whisk in the olive oil. Toss slaw with 3 tablespoons vinaigrette. Reserve extra dressing for another salad. Top with feta if using. Check out the book here. Recipe from Susan Pridmore of The Wimpy Vegetarian. Used with permission. Thank you so much for your lovely review of my book! I’m so happy you chose this recipe to make and enjoyed it!! !